I made this drill press table in about 6 hours. It features four long drawers for storage, an open center shelf, an adjustable fence, and a sacrificial plate in the middle. 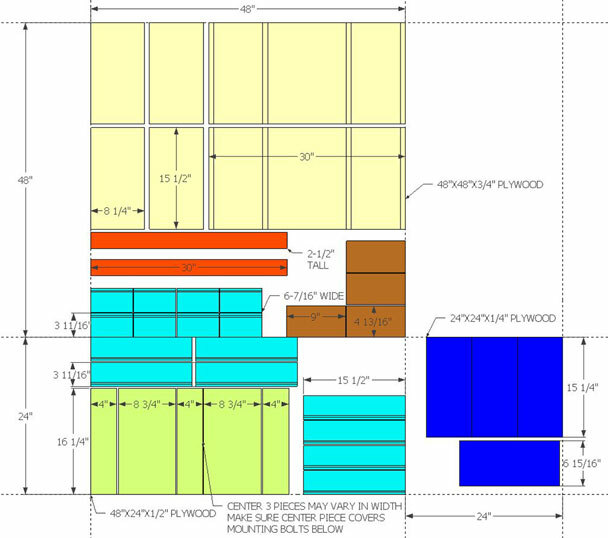 The layout diagram shows that you will need one 4’x4′ piece of ¾” plywood, one 2’x4′ piece of 1/2” plywood, and one 2’x2′ piece of 1/4” plywood. I miscalculated my scrap 1/2” plywood when I made mine so I had to use 3/4” plywood for everything except the drawer bottoms. If you follow the plans your drawers should be just a tad bigger than mine on the inside. You will also need two 3-1/2” long carriage bolts with some type of screw down knob for the fence. Either homemade or store bought will be fine. The diameter of the carriage bolts aren’t incredibly important. I used 5/16” diameter carriage bolts because that’s what I had laying around but you could use 1/4” as well. 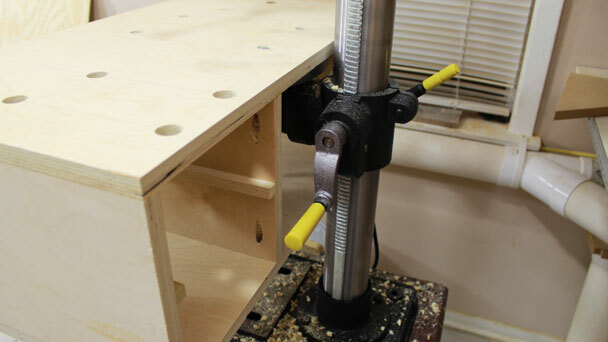 Add some drawer pulls, glue, bolts to mount it to your stock drill press table, and 1-1/4” regular and pocket hole screws and your good to go. It’s a good idea to go ahead and glue your two fence pieces together first. That way they will be dried and strong enough to work with when it comes time to drill the mounting holes in them. I made sure not to go overboard with glue so I wouldn’t have any squeeze out on top or bottom. I also clamped blocks to the top and bottom to make sure everything stayed lined up. The vertical frame pieces will attach to the top and bottom via pocket holes. Drill three pocket holes on the top and bottom of one side to all four of the vertical pieces. 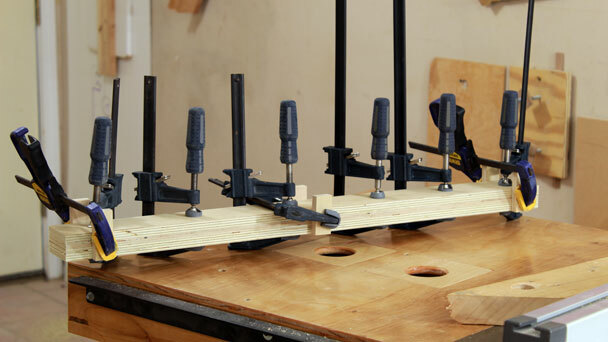 A pocket hole jig is one of the first tools I will recommend for any DIY’er out there. I’ve had mine for years and love it. 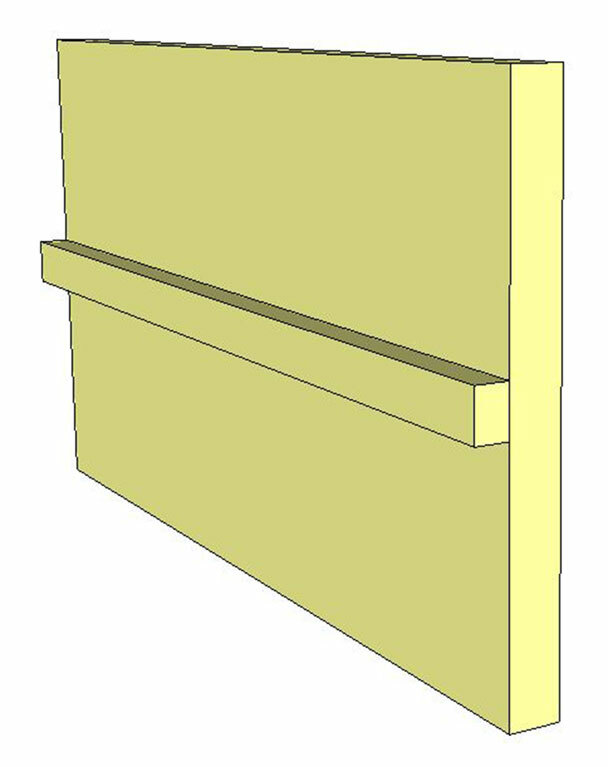 If you do not want to use pocket hole screws on this project you can simply cut corresponding dados and rabbets in the top and bottom pieces to accept the vertical pieces. 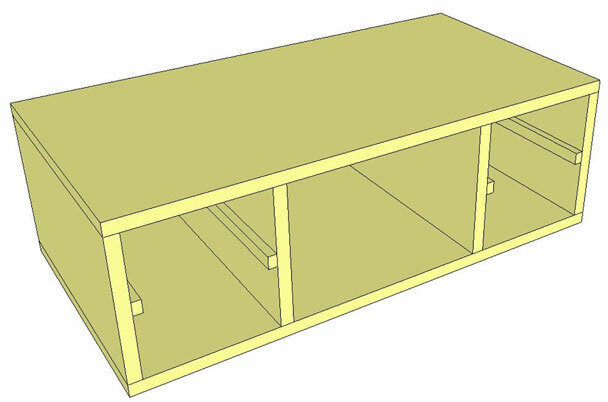 Note that if you choose rabbets and dados for the primary construction you will have to adjust your drawer sizes accordingly. Use some scrap from your cuttings earlier to make 4 drawer runners that are 1/2”x1/2”. Attach these to the center of the vertical pieces on the same side as the pocket holes. Attach all four of your vertical pieces to the bottom side of the top with glue and pocket hole screws. 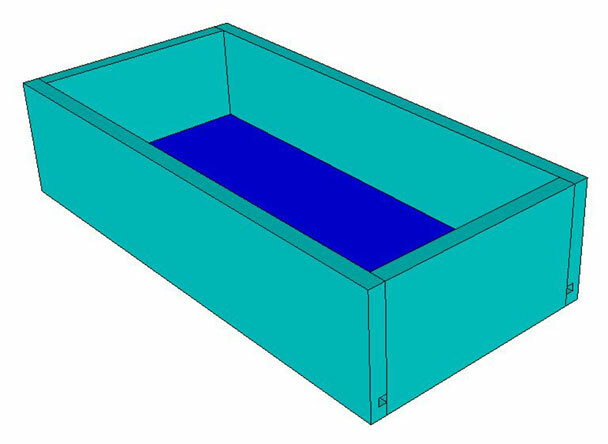 The drawer parts in this plan are sized for the spacing noted in this diagram. My stock drill press table is 11-7/8” in diameter so if yours is bigger you will have to modify the plan accordingly. I used a couple scrap blocks that were 7-1/2” long to aid in locating the center two verticals. For those who used pocket hole screws as I did you will notice that the remaining screws will be difficult to get to. If you have a right angle drill and a short driver you might be able to get to these. I do not have a right angle drill so I had to drill access holes in the top. It’s a good idea to take some time here to locate where to drill the holes. With the holes drilled you should be able to get everything with an extension on your drill (see video). At this point you can drill the mounting holes in the top to mount it to the drill press table. I made countersunk holes and used four carriage bolts to attach the wood table to the stock metal table. As you can see in the picture below this setup interferes with my stock table height adjustment handle. This is OK as I can still use a 1/2″ wrench to operate the lift mechanism. This handle will be extended to the side of the new table in a future project. The final top will consist of 5 pieces. You can now cut the outside two pieces at 4” wide. Next, determine what width the center piece needs to be in order to cover up your mounting bolts. The center piece is sacrificial and will just float in place to allow access to the mounting bolts for easy removal of the table as needed. 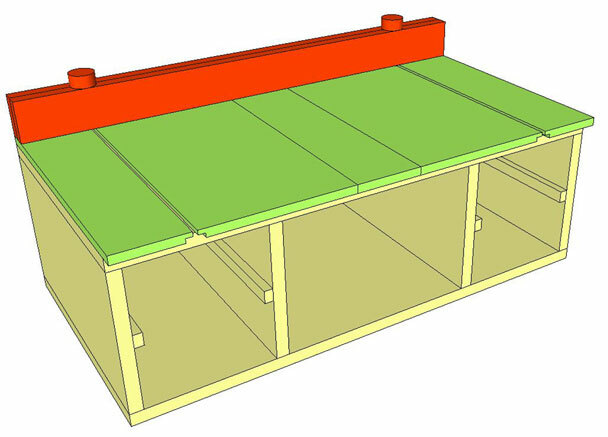 You should be able to use the measurements on the layout diagram as a good starting point to determine the size of yours. With all of your pieces cut, clamp the center piece in the center of the table. Layout your remaining top pieces and prepare for the rabbet cuts. The size of the rabbet will be determined by the carriage bolts you chose for the fence. 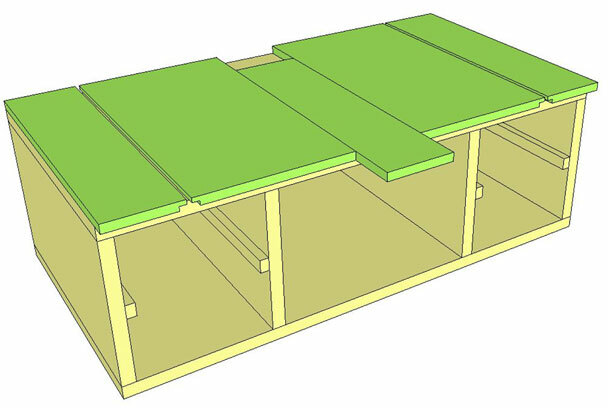 When two rabbets are put together you will form a t-track (see video or diagram). Cut all four rabbets. With the center piece still clamped place the second piece tightly up against it with a single piece of paper acting as a shim between them. Screw this piece down with the rabbet on the outside. Next, space your outside 4” pieces so that the adjacent rabbets form the t-track. Make sure there is enough room for the carriage bolts to slide freely in the t-track. Screw this piece down. The fence should be dry and ready to work with now. Mark and drill holes in the top of the fence aligned with the center of the t-track for your carriage bolts. I made the holes about 1/8” wider than the bolt to reduce binding when moving the fence. Slide your carriage bolts into the t-track, drop on your fence, and add your locking nuts. Check to see that everything is working the way it should. 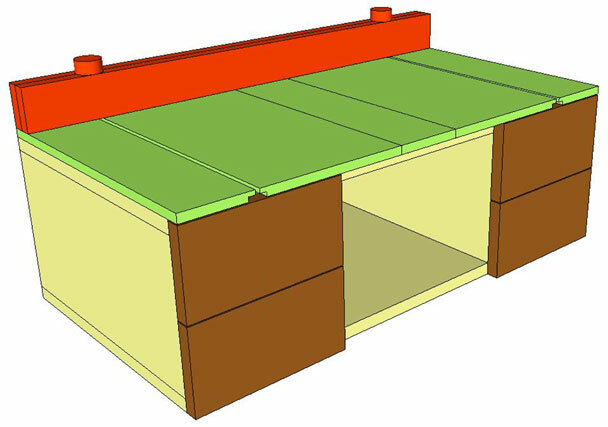 There are hundreds of ways to build drawers. Choose whatever method you prefer. 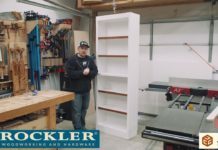 If you have never built any drawers before you can build them the way I did in the video or you can check out this other video I made on drawer construction. 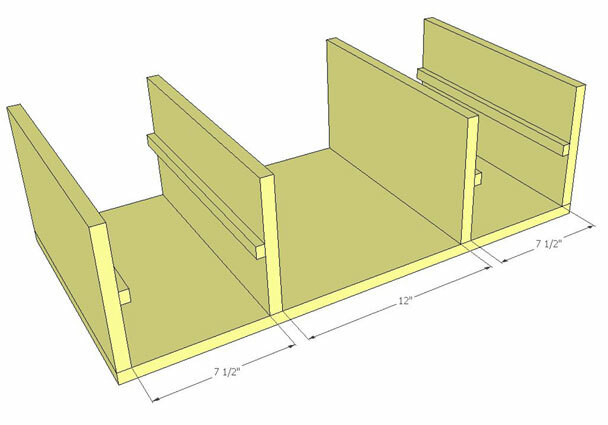 Attach the drawer fronts and your drawer pulls. That should be it! Click the following link to download the plan. Really enjoy your videos. Like to download the drill press plans in pdf. How do I do that? I don’t want to download a converter or any other program, just the pdf. first time watching your videos, great and I do appreciate them. Thank you Jordan. I appreciate the feedback. Jay, nice job. I enjoy your editing as it removes the superfluous and keeps the meet. Thanks for the feedback Jeff. I appreciate it. Great job, clear easy to understand, right to the point! Especially appreciate the clarity of the plans, as well as the fact that you point out the limitations of items. 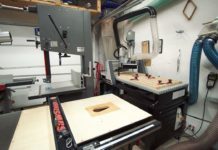 Such as the access to the height adjustment for the drill press table. Do you have any tips for wood turners? GREAT table, I am going to make 1 1/2 of these see I have a bench top drill press and a floor model. I’ll try to get you some pics of how they turn out. like the size, length especially! Easy build too! Muy bueno. Es un buen accesorio. What brand of drill press do you have? 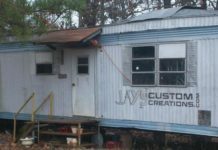 I am building my shop from the ground up. I like your approach: direct, , simple and practical. Perfect for beginners like me. Thank you very much! The document to PDF converter that shows up with your plans installs nasty “ask” files that are really like a virus. Can you kick them to the curb? Nothing is attached to any of my plans. If you are referring to Adobe Reader, which is the most commonly used program world wide to view PDF documents, you probably accidentally downloaded something else alongside Adobe Reader from Adobe’s website. When downloading it or any other program online make sure you uncheck anything that comes with it that you don’t want. nice job, how many inches is the drill press in that proyect?, good job man..
Nice job, i enjoy your editing. Nice design. A bit long for my tiny shop, but I will probably implement some aspects. I love that when you are using your nailer, it’s on beat with the music. Chuckled every time. Do you have this in pdf? I dont use sketchup. Thanks, Jay. 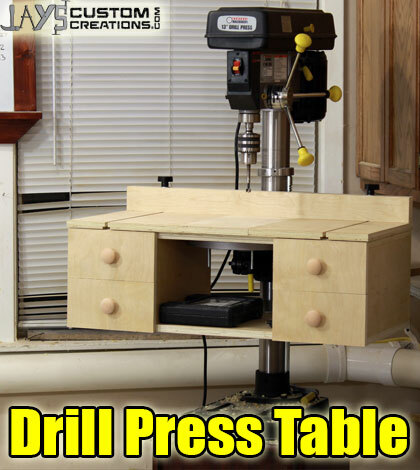 I have been looking all through you tube for a good design for a drill press table. Yours is the first that covers all the bases for me. It’s practical, useful, and easy to complete and use. I had seen some of your videos before but hadn’t payed as much attention as they deserved. None of the other plans made as much sense as yours. with more of your designs very soon.